Nina Kiriki Hoffman's first solo novel, The Thread That Binds the Bones (1993), won the Bram Stoker Award for first novel; her second novel, The Silent Strength of Stones (1995) was a finalist for the Nebula and World Fantasy Awards. A Red Heart of Memories (1999, part of her "Matt Black" series), nominated for a World Fantasy Award, was followed by sequel Past the Size of Dreaming in 2001. 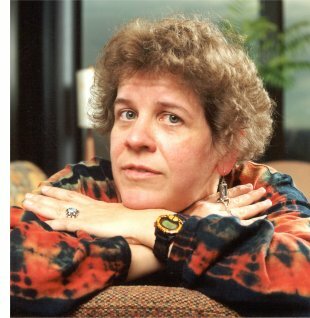 Much of her work to date is short fiction, including “Matt Black” novella “Unmasking” (1992), nominated for a World Fantasy Award; and “Matt Black” novelette “Home for Christmas” (1995), nominated for the Nebula, World Fantasy, and Sturgeon awards. In addition to writing, Hoffman teaches a short story class at a community college, works part-time at a B. Dalton bookstore, and does production work on F&SF. An accomplished fiddle player, she plays regularly at various granges near her home in Eugene, Oregon.